Josh Franco at work in the Smithsonian’s Archives of American Art. 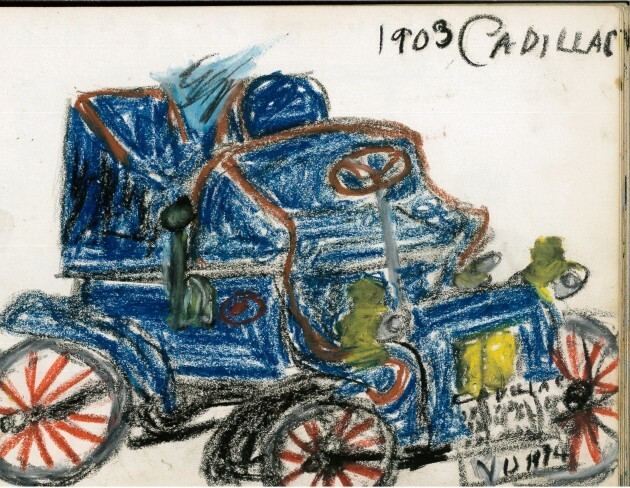 From love letters to tax returns, sketches and snakes, the Smithsonian’s Archives of American Art holds more than 20 million archival documents that tell the stories behind some of America’s greatest visual artists. Described as “the art world’s Fort Knox” by a contemporary art collector, the Archives is the leading research center dedicated to collecting, preserving and providing access to primary sources that document the history of the visual arts in America. 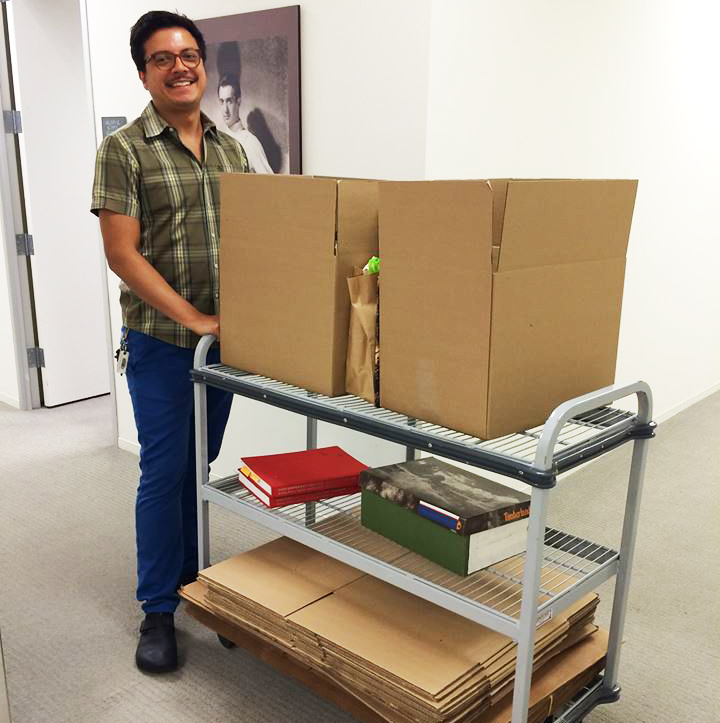 Smithsonian Insider spoke with Josh T. Franco, Latino Collections Specialist at the Archives of American Art, to find out more about his work acquiring these important documents and how the Archives preserves the personal papers of America’s most important artists. Q: What is your role at the Archives? 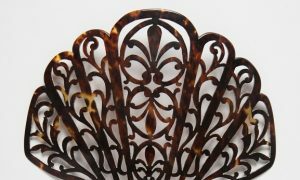 Franco: To acquire important personal papers and records that can serve as primary sources for the study of Latino art. 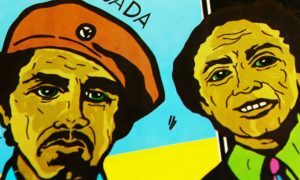 I begin by examining the existing collection to determine where to focus my search, and then target acquisitions that reflect the deep inter-connectivity and legacy of Latino art and artists in the United States. I consult frequently with Archives’ Deputy Director Liza Kirwin, who has been involved in several acquisition initiatives focused on Latino art, and with staff and curators from across the Smithsonian, including the Smithsonian Latino Center, the National Portrait Gallery and the Smithsonian American Art Museum. As the Archives serves as a research center for the study of American art, one of my main duties, when not out searching future acquisitions, is to advise researchers on the many ways Latinos have contributed to the canon of American art, and bring relevant sources of information to their attention. 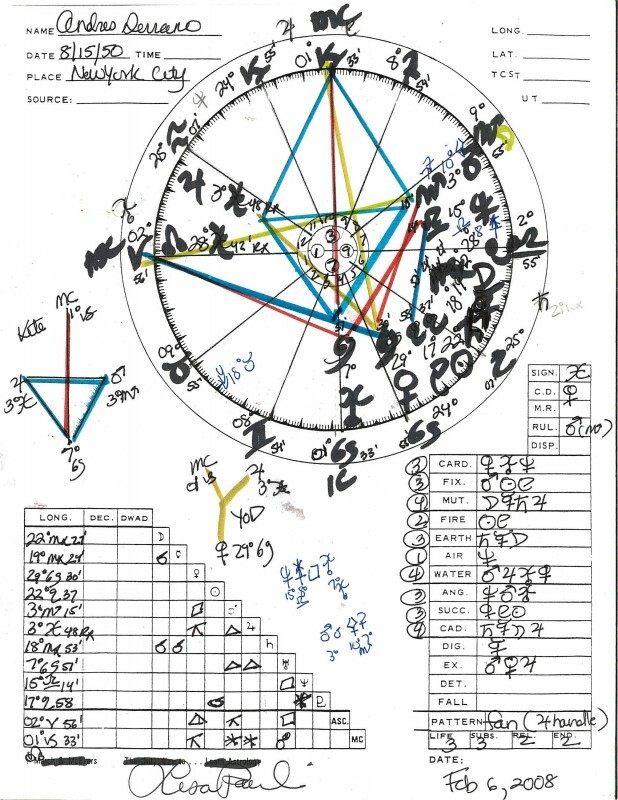 Andres Serrano astrological natal chart, 2008 February 6. Andres Serrano papers, 1979-2012, Archives of American Art, Smithsonian Institution. Q: How do you go about acquiring an artist’s papers? Franco: It varies case-by-case. The process can be fairly straightforward over a period of a few weeks, or it can be really involved and take years. Sometimes I approach artists who have already donated to a Smithsonian museum. In many cases, though, I contact an artist whose art is not at one of our museums or who donated artwork long ago. In the case of a recent acquisition, I e-mailed American photographer Andres Serrano expressing my interest in acquiring his papers for the Archives. I set up a meeting at his home in New York City where I introduced myself, described the Archives of American Art, and listened to Serrano and his wife, Irina Movmyga, describe how his papers were organized and stored. Over e-mail, Serrano later agreed to donate his papers. On my next visit, Serrano had all his papers out for me to look through, a process that took hours. I picked the ones I was interested in and gave him a few weeks to make sure he was ready to part with them and to make copies of anything (the Archives always acquires originals). I then went back to Serrano’s home to pick up the papers, which I packaged and shipped to the Archives in Washington, D.C. I then worked with the Archive’s registrar to accession them into our system, label them and place them in our facility. Justin McCarthy pastel drawing, n.d. Angel Suarez Rosado papers, 1978-2010. Archives of American Art, Smithsonian Institution. Q: How do you determine if certain items in an artist’s papers go to the Archives or to an art museum instead? Franco: Usually, it’s pretty clear. We do not collect artworks. Occasionally, we encounter sketches and preliminary drafts that could potentially go to an art museum instead of the Archives. In such cases, the donor and I together try to figure out the best place for them. This conversation involves looking at the practice of the artist as a whole, as well as how he or she has been contextualized in exhibitions and publications over the years. Often, we can see precedents for how to treat different documents. One of my main questions is: “How much information does this sketch or draft contain?” I’m always trying to keep the Archive’s researchers in mind. WERC, sketch, n.d. Jari “WERC” Alvarez and Geraldine “Gera” Lozano papers, 2005-2015. Archives of American Art, Smithsonian Institution. For instance, in a recent final review of one artist’s papers, Jari “WERC” Alvarez leafed through a sketchbook he had agreed to include in his papers. WERC is a graffiti and mural artist so drawings on paper are not central to his practice. Yet, as he leafed through, he yanked a single page out of the sketchbook to keep for himself. In that moment, he decided that one page was a complete drawing that he did not want to donate with the rest of his papers. He signed it right then and there and put it away. Another example is when an artist’s papers include artwork by a different artist. This was the case with Angel Suarez Rosado, whose papers included a sketchbook of drawings by Justin McCarthy. Rosado made the decision to include McCarthy’s sketchbook, a gift from the artist, with his papers and donate it to the Archives. Q: What do you think are some of the most interesting things in the Archives? Franco: Robert Smithson’s papers include a rattlesnake head in a jar. This may sound odd but it makes sense since he was interested in the natural sciences, famously creating “Spiral Jetty,” a massive earth art spiral. 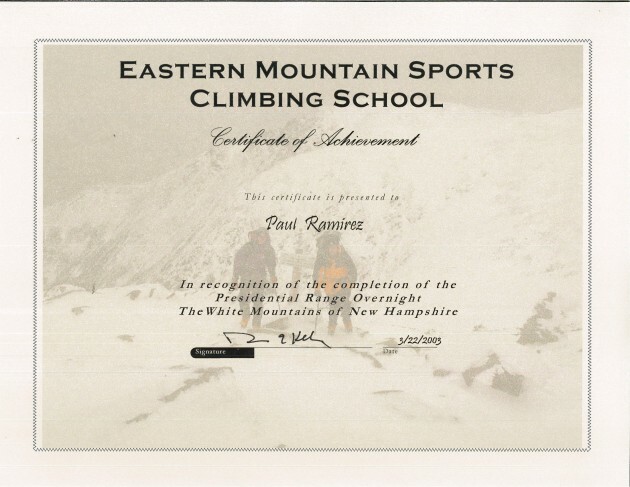 Eastern Mountain Sports Climbing School certificate of achievement, 2003 March 22. Paul Ramirez Jonas papers, 2002-2004. Archives of American Art, Smithsonian Institution. 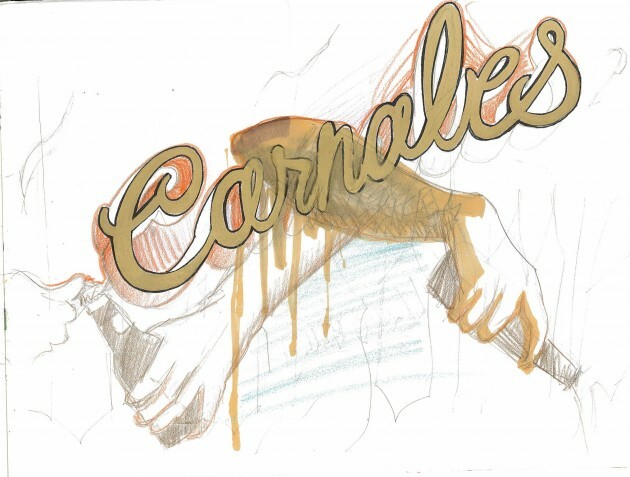 We have papers that speak to an artist’s process, like in the case of Paul Ramirez Jonas. In the early 2000s, Ramirez Jonas began the Summit Project, which involves him climbing to the highest peak in every U.S. state and “erasing” its official name through a series of gestures, which he photographs. To prepare for the project, Ramirez Jonas trained for mountain climbing, and his papers include a certificate of completion from Eastern Mountain Sports Climbing School in New Hampshire. The project is ongoing and has evolved over the years, so it’s great to have original documents like this that shed light in his process. I also find connections between people represented in the Archives very interesting. Art writer and critic Lucy Lippard’s papers include handwritten letters from artist Julie Ault. Ault was interested in eastern practices and performed several stone and crystal readings on Lippard’s behalf. Lippard’s papers include several letters describing what Ault discerned from the readings. I came across these letters during the process of acquiring Andres Serrano’s papers. Serrano and Ault were married, which is reflected in Serrano’s papers. I was curious where else Ault appeared in the Archives and that’s when I found her letters to Lippard. It’s exciting when new acquisitions reactivate existing holdings like this. 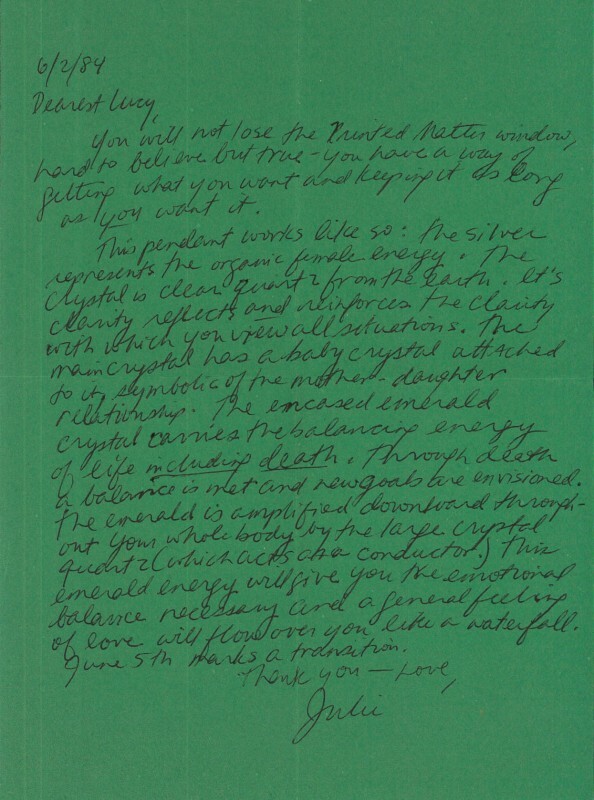 Julie Ault letter to Lucy R. Lippard, 1984 June 2, Lucy Lippard papers, 1930s-2010, bulk, 1960s-1990. Archives of American Art, Smithsonian Institution. Q: Who typically consults the Archives? Franco: Mostly art history scholars consult the Archives but many others also visit us, including graduate and undergraduate students, curators, historians, journalists, genealogists, biographers, and practicing artists. The Archives’ primary function is to preserve important documents, but part of our job is also to welcome researchers and let them know what they can find. When it comes to deciding what to acquire I put myself in the shoes of a researcher and try to think of what would be useful to them. I look for things that offer a glimpse into an artist’s life, like personal correspondence, or relevant documents that can be a resource, like receipts for materials used in artwork.